Need more information about booking Home 7283385 ? VILLA discreet luxury in a 6000m² of greenery, with panoramic views. 2 min walk (in swimwear summer) from the beach (1,5km) nestled in the lovely Gulf of Lava (provencal port). modern villa, in large wooded and fenced property. Large bedrooms with dressing room and en-suite bathrooms beautifully decorated, equipped with two single beds or double bed. With panoramic views of both the Gulf of Lava and the countryside, 2 min walk of the Sea. Covered terrace, a true dining Summer. The Gulf of Lava is a nice mini resort away from all the tourist spots yet ready wonders that are the creeks (coves) Piana (60km), and the Imperial City AJACCIO (25mn). The beautiful sandy beach 1.5km never overcrowded waiting. In season, all water activities are offered as well as aid post and bath children. 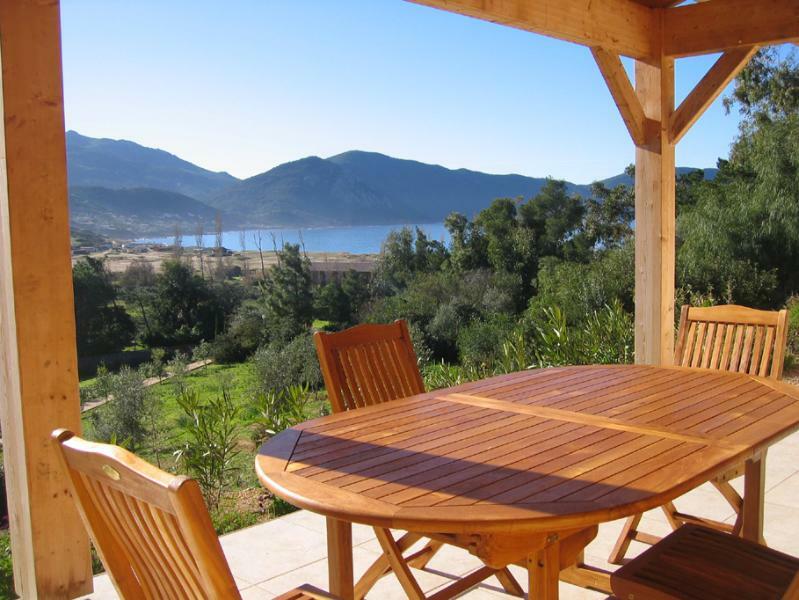 The villa for 8 (ideal) / 10 people, can be reduced to 6 people off season with a suitable tariff (see other annonces4 / 5 pieces). MACHINE HOUSE INCLUDING. Obligatory end of stay, upon request and at departure. In BEEN stays go from Saturday to Saturday. Short stays (unless otherwise agreed) may be straddling two weeks. The European prime turtle park "A Cuppulatta"
Tower Pelusella on my Gozzi, the way of the north shore ridges of the Gulf of Ajaccio, Capu The tower's south shore Muro, the cascade of English to Vizzavonna. Capu di Feno, Tower Capu Rossu, the Creeks of Piana, Lake Créno. and plenty of other equally beautiful hikes. Lifts rivers and swimming in their basins or potholes. Compliance with the rules of good neighborliness. minimum age of renter: 18 years. Headroom residence and not individually fenced Villas can accommodate pet dogs in Summer and the dog category 1,2,3 all year. nocturnal disturbance likely to verbalization and redress for damage. You can get in touch with Paulin (the owner) through the contact form on this page. Send Paulin (the owner) an email through the contact form on this page. Alternatively, if there’s a phone number on this page, you can call them. How do I contact Paulin (the owner)? If you’ve already booked, go to Manage your holiday booking to view Paulin the owner's contact details or send them a message. Or send Paulin (the owner) an enquiry through the Contact the owner/manager form if you’d like a quote or more info first. When you pay online through the Book your stay form, a booking request is sent to Paulin (the owner). You’ll find out within 24 hours whether they’ve accepted - no money will leave your account before then. You can also request a quote from Paulin (the owner) through the contact form. The owner will email you the total cost for your dates and a link to book and pay online. Use the Book your stay form to pay provisionally online. You can pay by credit/debit card or PayPal. Paulin (the owner) will have 24 hours to accept the booking and no money will leave your account before then. Why can't I call Paulin (the owner) before booking? You’ll need to contact Paulin (the owner) to do this. Send them a message in Manage your holiday booking or through the contact form on this page. You can request to change the dates or number of people on your booking via the Manage your holiday booking page. To change your holiday dates use the Edit booking button. If you need to change the number of guests staying then send Paulin (the owner) a message. If Paulin (the owner) agrees, they’ll send you a revised quote outlining the changes. You can review and accept/decline this from the Manage your holiday booking page. You’ll have 48 hours to take action before the revised quote expires. Estimated price per night based on a weekly stay. Owner fees of £104.00 per stay may apply. Enter your dates to see the total cost.